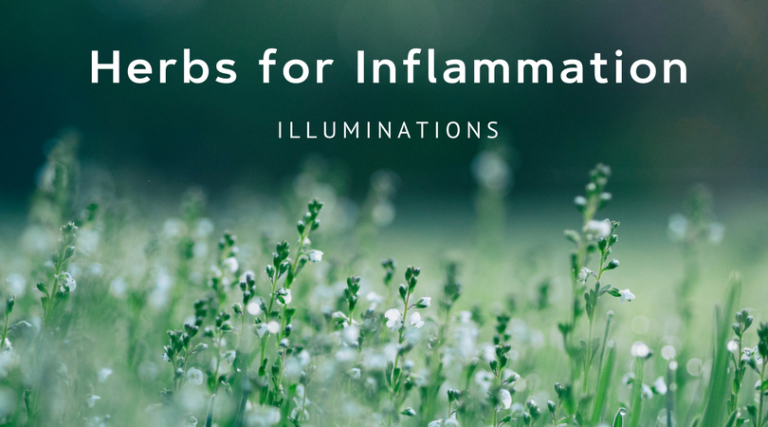 Inflammation; A Tea Series at Illuminations - Illuminations! We will be exploring herbs for inflammation, what causes inflammation, how to avoid inflammation, and ending with making a personalized tea then trying teas the we made during this 3 week class. Since each class builds upon the last class it is highly recommended that you attend all classes. Pay $88.00 for all three classes at once or $35.00 per class. Reserve your spot in the class by calling 319-775-0117 during regular business hours or online, any time, at https://goo.gl/bkBVKt . Week 1: What herbs are helpful for different inflammatory conditions? You will be surprised about the variety and types of herbs that treat inflammation. We will discuss warming and cooling herbs and when to use what herb and technique for different types of inflammation. $35.00 including extensive handout and hands on herb tasting 6-7:30 pm, Wed Oct 10. Week 2: We will discuss formulation of teas for inflammatory conditions and work on some case studies, this is a favorite class where you get to come up with your own formulations with help from the group and from Donna. During this class you will formulate a tea for yourself or loved one designed just for you. $35.00 for extensive handout 6-7:30 pm, Wed Oct 24. Week 3: Tea Party day! We will make our formulations from the previous class and try them and everyone else’s if we want to! I will make cookies and zoom balls to share. $40.00 includes teas and cookies. 6-7:30 pm, Wed Nov 7. About Donna Bass: In 1992, Donna started formally studying herbs at The Mustard Seed in Portsmouth NH with Salandrea. In 1998, she served a one year formal apprenticeship with her. In her studies Donna realized she did not have a strong enough background in science and physiology so she enrolled in the University of New England. Donna graduated with a degree in Behavioral Neuroscience in 2011. Then she went to graduate school at The Institute of Transpersonal Psychology to study energy and healing. In 2012, she studied aromatherapy and herbalism in Hawaii. ​Currently Donna is finishing her Master Herbalist Certification at Green Wisdom School of Natural and Botanical Medicine. Her approach is evidence based wise-woman tradition. Donna is interested in YOUR innate ability to maintain chronic wellness. She looks forward to working with you. Donna can be reached at www.mammamoonherbals.org or 832-588-6335.